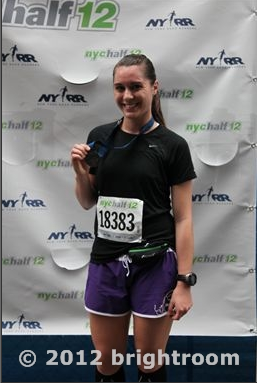 NYC Half 2012. A happier time. You may be asking yourself... "Megan, what happened to you?" For those of you who are new to my blog, unfortunately a week or so ago I was "officially" diagnosed by my doctor with IT Band Syndrome (even though I self-diagnosed myself at least 2 weeks ago). Since that time I've become slightly obsessive in learning everything I can about this injury and reading blogs, medical websites, and forums to see what the best treatment techniques are. I need to get healthy and back to running ASAP! You understand, right?! I hate you IT Band. We are not friends. Since this is a common injury, I know many people probably are wondering what they can do for it. I already described the causes and symptoms of IT Band Syndrome in a previous post, so I'm assuming this information is mainly for those of you who already know you have it. I've decided to compile some of the information I know about this condition and tell everyone exactly what I've been doing for treatment. Disclosure: these are things I have found that helped me, but everyone is different. Also, I am not a doctor (the schooling takes too long) and these recommendations are only from personal experience. I recommend that you visit your doctor for additional information about your own injury. Anyone with this injury will tell you that the first step in recovery is stretching, and lots of it! I found a lot of good stretches around on the internet, and this video below summarizes pretty much all of the major ones I use. I also do the pigeon pose (yoga pose), but be careful with that one at the beginning. Also, this stretch is great but its another one that I don't recommend doing while your injury is still really acute. These stretches I do daily at least 2x each. You can do them while watching TV, but its crucial that you stretch for this condition. Its the only real way to recover and prevent it from coming back again. The other major thing I do is foam rolling. I use The Grid foam roller, but you can pick up a cheaper one at most stores like Target. Usually, I foam roll for 5 minutes then take a break and do 5 minutes more. I do that 2-3x a day. Usually while I'm watching an inspirational show or something.. like Millionaire Matchmaker (hm, not inspirational you say? I beg to differ). Honestly though, with foam rolling the more often you do this, the better. It WILL hurt like hell at the beginning but after a week or so the pain won't be as bad. Ice baths and ice packs are also recommended since this is an inflammatory condition. The main goal here is to reduce the inflammation and ice is the way to do that. You can put ice packs on the side of your knee where the pain is a few times a day for no more than 15 minutes at a time. I usually take 15 minute ice baths instead since it covers the whole length of the IT Band. Once you are in there for a minute or so, your legs get numb and you'll barely notice the cold. It's not as bad as it sounds. Plus, feel like it's helped me so it might be worth a try. No idea who this is but ice baths aren't this horrifying! Also, there's no need to put ice up to your neck. Ever. 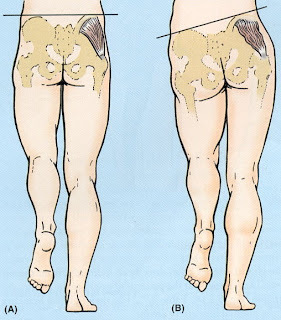 It is also possible that muscle weakness in the core and lower extremities played a role in your IT Band syndrome. The condition will only return if you don't focus on strengthening the weak muscles. Specifically, the most important areas to strengthen are your glutes and thigh and leg muscles. I have been following a really great routine that was posted by a runner. It provides 6 different exercises to use in order to properly rehab the IT Band (below). Do these exercises only when your acute pain has diminished or you may continue to irritate the band. I do these every other day 2x each. 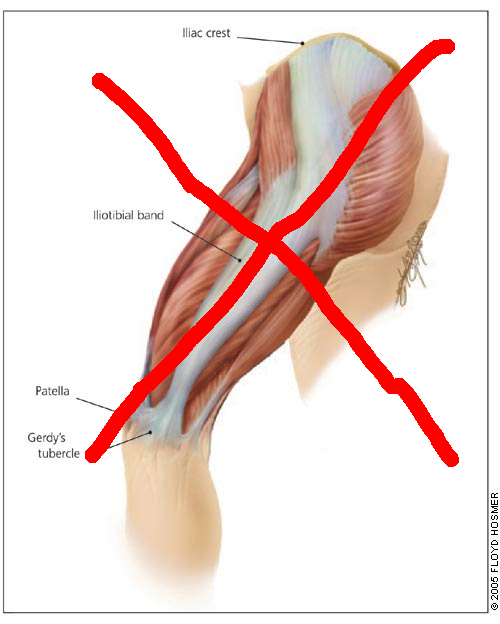 Also, even though its a small muscle the gluteus medius is crucial to running, but is weak in most runners. 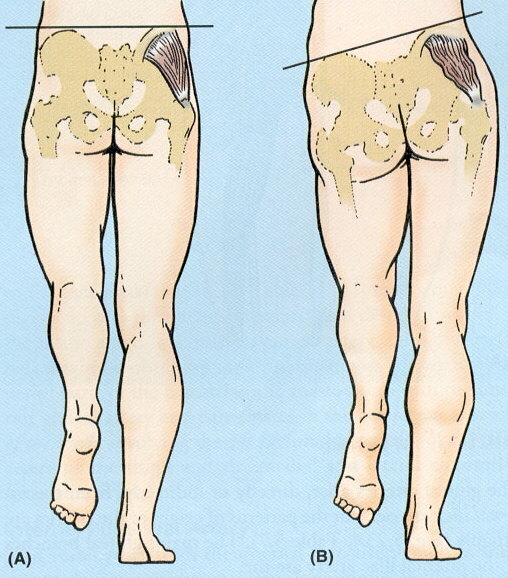 It's job is to abduct the hip and stabilizes the pelvis. When it is weak, it can cause tension in the IT Band which can lead to inflammation (see the photo below). I have been working on strengthening this muscle and have been using these awesome exercises. I typically do these every other day (to allow the muscles to repair themselves) along with the other strengthening exercises. Imagine your IT Band stretching over your hip and knee joints in photo B. Not good. Core strengthening is also recommended during rehab, since a weak core can have negative effects throughout your body and lead to injury. Since I definitely have a weak core (watch me do a plank... I'm pathetic), I have been doing yoga for this and also for general stretching. In a previous post I provided two yoga for runners videos that I do every few days as possible. Once the acute phase is over and your pain diminishes, you may want to try some light crosstraining (e.g. elliptical, bike, swimming). I highly recommend swimming since it put the least amount of stress on your IT Band. But if you do the others, take it easy with minimal resistance. And ease back into these exercises slowly. DO NOT do any of these if they cause you any pain, you will only make your condition worse! Other suggestions to help heal your IT Band include: taking anti-inflammatories (daily from a doc or Aleve), checking your shoes to see if they could be causing misalignment of your lower body, and eating right. A friend suggested to eat more protein during the healing phase so I am trying that (not sure if it works, but hey I'll try anything). I am also making sure to take my multivitamin, my random assortment of vitamins, and also Vitamin C. Vitamin C has been said to aid in healing, so why not give it a try. 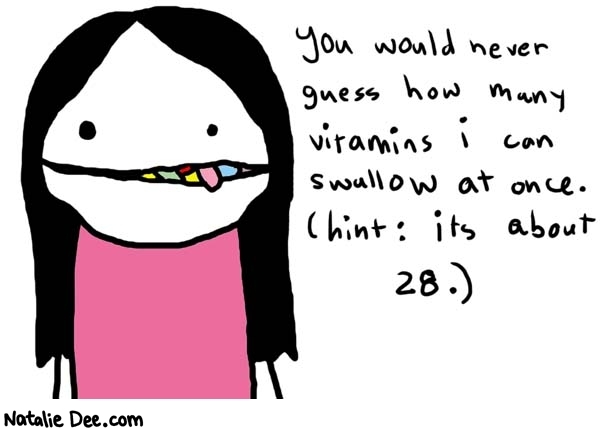 Don't we all just love our vitamins?! If you really NEED to run or are just returning to running after this injury, you can check out the IT Band strap. It helps distribute pressure to minimize friction of the IT Band over bone. This should not be used as a permanent solution by any means but is an option for some situations. I really hope this information helps some of you. I will keep you posted on my recovery and how all these strategies are working for me. Heal well everyone! stretching, foam rolling, ice baths/ice packs, lower/core body strengthening, yoga, light crosstraining (especially swimming), taking anti-inflammatories, IT Band strap, eating right, checking your shoes.. and just hoping your body cooperates! Any other suggestions for IT Band Syndrome recovery? What injuries are you dealing with at the moment? What types of vitamins do you take? ugh! I had IT issues last december, it was definitely not fun! Right now I'm sidelined with a stupid foot, but I've discovered a newfound love for the exercise bike! The IT Band is the worst! I'm so annoyed at my leg haha. Sorry about your foot :( Hope you are doing rehab or whatever you can for it. Also, I'm actually learning to love the elliptical right now! Thank you for this post! I am going to start a serious program for myself now to help mine heal ASAP. All of your suggestions will help me so much! No problem. Hope it helps and if you have any other questions feel free to leave me a message! Good luck and I hope you get better soon too! Hi great post! I Have been suffering with mine since december and i am not managing to run over 30 min without pain. I do everything you mentionned!! I was really depressed, now i am happy that i can run 30 min but I already missed a marathon last weekend! Now planning to run another one in the fall so i hope i am up and running by then!! Patience is the key! I hope yours wont take too long! good luck! I hope mine won't take that long either, but I hope yours gets better ASAP! Its a horrible, annoying problem. Ugh! Glad to see you are making progress though, thats a good sign! Ugh...I dealt with ITB for 3 years. THREE YEARS...I'm shuddering a little inside recounting it. Anywho, for me I learned to roll, roll, roll and when I was tired and in pain (seriously the first few rolls were as bad as some gnarly contractions in childbirth) I rolled some more. Then I really worked on my stride. For me this meant transitioning to minimal shoes. I *heart* the NB Minimus line. After a few months I was back to my full strength, pain free and running faster than ever since I cleaned up my stride. Hang in there...Recovery is around the corner! I REALLY hope mine doesn't take 3 years! I admire you for sticking with it so long. I don't know if I would be able to deal with it mentally! How did you change your stride (what did you do differently than before)? I was also thinking about going to get checked for new shoes, I may consider it. I've been afraid of minimalist though cause I'm a big baby who's afraid of change. I may have to consider it though if this pain stays around. Ugh, its so annoying! Okay it took 3 years since I wouldn't go to physical therapy and really wasn't so concerned about getting the problem fixed (my stride & strike). I actually went to a PT who watched my stride and found that ran with my legs far too close together (hello chaffing!). I also found out I pronated slightly and was a heel striking master. Let me tell you, I was reluctant to go minimalist but am SO glad I did. I LOVE, LOVE LOVE it. It is a huge adjustment and you have to go slow...but truth be told you can't mess around on your strike or you start hurting. In the 15 months since I've gone minimalist I've had to deal with REALLY tight calves and battle tendonitis in my foot when I get lazy in my strike & stride. Your running form pretty much as to be spot on. If I start noticing tweaks or pains I immediately get to the gym and hop on the treadmill and watch myself run (so vain!) to correct whatever is off. Long story short - steep learning curve, but I think the long-term payoff will be worth it. Thanks for all the info! I'll probably try to get a gait analysis before I return to running, just to see if that's the cause. I'm also thinking about minimalist running and will real more about it in the next few weeks (I've dealt with tight calves so I'm pretty good at treating that too.. I know, my body really hates me). BTW Good idea to watch yourself run at the gym every so often. I usually avoid the treadmills with the mirrors because I always assume I look like an idiot running. I'll have to get over that though, for the sake of my IT Band haha. Indeed! I feel like a narcissistic masochist when I hit the treads at the gym :) I have a feeling I should blog about my transition to minimalist one of these days since it seems to be popping up on a lot of blogs! Haha. Hey, whatever works keep on doing it! I think blogging about your transition is a great idea. Might help a lot of people like me who are on the fence about it! Wow post was very helpful. I just found your blog today and I already love it! I was officially diagnosed with IT Band Syndrome during the training of my first marathon about 2 years. I couldn't go more than 12 miles or so before my knee was screaming at me to stop! I actually just got a foam rollar last week and plan to start taking care of my issue now. I haven't been running like I used to but have already been looking for some races to train for! Hey Allison! I'm glad the post helped you, I just wanted to compile a lot of the good information I found to maybe help other people like you! Great blog post. I am a new runner.....6 months and hurt my IT band a few weeks ago and i am miserable. I finally foind something that i love to do and now i cant. I ran my first race, a 10K and the pain i was in was worse than child birth. I was up to 6 miles now i can only do 2. I feel like all i do is stuff for my IT band. Hope i can get back up to 6 miles soon.